Sure. All light sensitive stocks need to be kept in the dark. You want correct exposure to the light coming from a lens in a camera. After exposure the film is again protected against light until development and fixation. Full-flange spools and protection leader, additional length, help keeping light away. The outermost windings cover the inner length. After having threaded up your camera in the shadow you run the film forward in the closed camera about three feet. The veiled beginning is wound up, unexposed film brought into position behind the image aperture. Once fixated the film can be viewed, projected, duplicated. Double-Eight film runs twice through the camera. First run exposes one half of its width, then you swap spools and expose the other side. Processing goes as 16mm wide film, often together with 16mm material on collection rolls. After processing it gets split in two, the 8mm strips joined and returned to you. That way you have 50 ft. of Regular-Eight film out of nominal 25 ft. of Double-Eight. The actual length of a portion is about 32 ft. There is additional length on almost all portions, be they on darkroom core (magazine loads), be they on daylight loading spools. You have reversal stocks and negative films. Reverse processing yields a positive image for direct projection. Negatives usually are printed onto dedicated stocks, you have so-called contact positives. The negative-positive process is the professional approach. Reversible films are the classic amateur stocks. I have a Kodak Brownie no 2, from 1960 if I'm not mistaken. Fine, a beginning. Next things to add ar a tripod and a projector. That’s the basic set. Have fun! 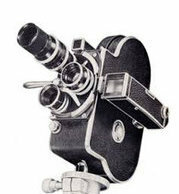 I am also a D8 user and have a Bolex C8 with a few lenses I have collected off ebay. I have been filming for about a year or so and mainly shoot colour negative, which I have scanned and then edit on my computer. 8mm is great as its reasonably cheap and the results are certainly good enough to make movies for family and friends. Also, practice makes perfect and it is cheap enough to allow you to experiment. Have you shot a test roll yet? I found it quite exciting when I got my first scan back and you see that everything is working! I also love the idea of bringing these old things back to life. I have bought a few 8mm books very cheaply off ebay too and these have helped a lot with the basics. Who is making R8 Color Negative? I saw some come through Cinelab recently and I have been shooting Fomapan on a Bolex B8L someone recently gave me and I am liking the tiny size of the format. Who is making R8 Color Negative? I bought some off a guy on an 8mm Facebook group. Sadly he has none left, as I recently asked him. I have 3 or 4 rolls left. This guy told me there was someone in London who has the machinery to reperf film into various formats. So if you had any film lying around, he can turn it into usable D8 film. I don’t know if he is doing it anymore, so I have emailed him directly and asked. I will report back when he replies. It would be great to get people up and running with colour film again! Wittner Cinetec in Germany has still some wittner chrome 200 double 8 color reversal stock in a length of 7,5m. But it is the last he manutactured, because the stock is finished. They also have a machine for perforation. What about Double Super 8? Anyone processing that if you can find the film? I've gotten R8 Foma BW developed at CineLab with good results. Also I know Dwayne's and Spectra will do R8 E6. Spectra will do CN and BW as well I believe. They both even sell the film. Our man Steve Chevalier in B&W at Cinelab has really been working on Fomapan developing and I think it has gotten really good, it takes more to dry than Tri-X but the DS8 I have been shooting I really like allot. Thanks...I love R8. Cameras are tiny and easy to use. Honestly, R8 is the new Super 8 since Super 8 has gotten so good with the Vision stocks. I have to test this Canon Scoopic Double Super 8 camera and have some fresh Foma B&W. That may be tricky to get processed. Ha you mean in terms of retro aesthetics? Definitely not cheaper or as available sadly. I've only shot R8 once in an old Keystone K35 I got from my grandfather-in-law. The lens was definitely not in great shape and had fungus or other aberrations in it. To your point, you can actually see a mixture of 2K scanned Kodak Tri-X shot on a Nizo 801 and FomaPan 100 shot on the Keystone in my film below. I'll leave it up to you to figure out which shots are which. ;) But no doubt, it seems like everything has bumped up. 16mm is the new 35. and Super 8 is the new 16mm. So it's only natural R8 is the new S8. I have a couple rolls of Cine-X 125 and CineChrome 100D in R8 that someone gave me. I need to shoot em but no camera good enough! Anyways! Spectra lists on their website that they do DS8 B&W and I believe CineLab does too but Robert would have to confirm that. We do DS8 B&W and in a few weeks we will be running E6 as well. We also recently ran some ECN DS8 stock for a customer. I would be curious to find out where you can obtain ECN in DS8. AFAIK no one is offering this in the marketplace. Hi all. Quite a few posts since my last visit. Great to see people are still interested in film! Edward Nowill is the guy in London who carries a selection of B&W film. He says he hasn't had any colour stock in for a while. However, he can reperf film into D8 format. He can recut some films into D8. Eg he can cut 35mm offcuts into 16mm,D8 etc. This is what the guy on facebook had done. He bought some film ends and sent them to Edward who recut and reperfed them. If anyone wants his full details, please let me know. I have bought some B&W stock and he is great to deal with - a very nice guy. correct. edward is the man! im in contact with him and by this or next month i will let him cut and reperf some vision 3 / 250D. i also have a bolex C8L and i want to try vision3 on that camera. I got some Vision 3 50D cut down to R8 & re-perfed by Edward recently. It's intended for some shooting with a loaner Ultrapan 8 camera. After I test the stock, I might sell off a few 100ft spool-downs since I have 1000 ft. and it's probably more than I will ever be able to shoot. Message me if you're interested. "The film has a nominal speed rating of ISO 100/21o when processed in R-100 Process. Other processes can cause deviations from the nominal film speed. It is, therefore, recommended that the real film speed be checked by trial tests in such cases" . At Cinelab are you using the R-100 process per Foma's tech sheet and do you recommend that I expose the film at the box speed of 100 ISO ? I am asking because I recall having come across a few comments from users on other photography forums which indicated they think that 100 ISO is not accurate , the Foma 100 works better if treated as 80 ISO (one person even said he treats it as 50 ISO ! ) , but I wonder if this is influenced by the greater number of options for developing times that still photographers use or they may have been discussing using Foma 100 negative film (?) , so I may be misunderstanding what I read. Would you say I should just set my light meter for exposing the Foma R-100 as 100 ISO and not worry about it ? From the 1 roll I've shot with it that I shared before in this thread, I'd say yes. I mean it somewhat depends on lighting but mine was properly exposed at 100. Perhaps some of mine were more like 80 or less because of the harsh lighting and limited aperture on my camera though. If you go back a page and watch the film I posted, the grungier film with some lines and a blurred spot in the middle of the frame in it is the FomaPan R100. The cleaner processing with slightly curved gate on the right edge is Super 8 shot in my Nizo 801. I wouldn't use my video is the final say on the process though. This was the first roll of film that little Keystone 8mm camera had seen in probably 40 years. And if CineLab is really improving their Foma process then hopefully your results will be even cleaner.